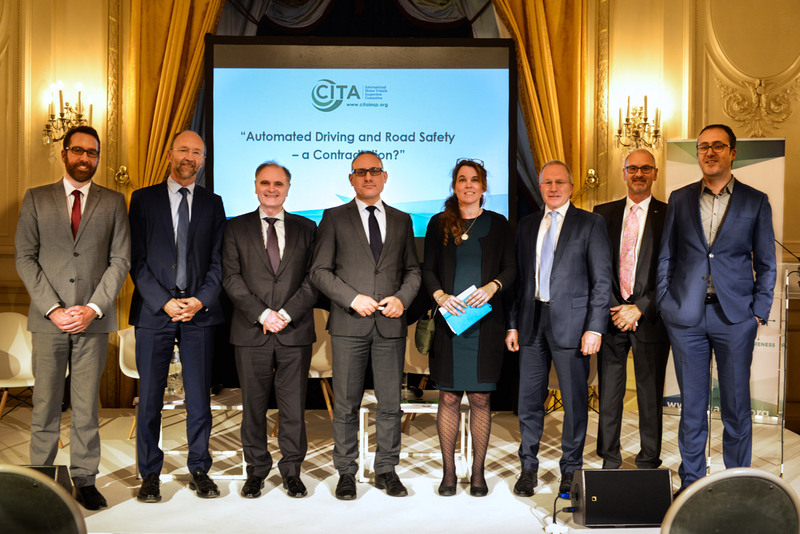 CITA, in collaboration with VdTÜV, hosted an evening-debate last Monday, 19 November 2018, at the Concert Noble in Brussels, titled: “Automated Driving and Road Safety – a Contradiction?”. “We are at the beginning of road transport revolution. Many things will change and all of us, as stakeholders, have to work to avoid that negative impacts may jeopardize all the potential of new technologies for a better road transport” he said. Dr. Matthias Schubert, Executive Vice President Mobility at TÜV Rheinland AG and Member of VdTÜV Transport Commission, exposed to the attendees the consumer’ perception and key challenges for responsible third party players in realizing the vision of automated driving (Download here his presentation). Mr M. Baldwin (Deputy Director General DG MOVE and European Coordinator for Road Safety) explained how the legal framework meet the technical evolution, and he gave the point of view of the EC on the matter. 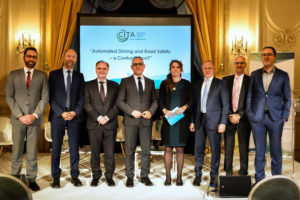 During the panel, composed by Mrs Sigrid de Vries (Secretary General CLEPA), Frank Leimbach (Director Technical Affairs of DEKRA), Mr Matthew Baldwin (Deputy Director General DG MOVE) and Mr Ismail Ertug (MEP, PS Group), it been debated about changes through highly automated driving (HAD), the opportunities to improve road safety and challenges for testing and certification of autonomous vehicles and components to make it safe and secure along the complete life-cycle. The development of automated driving systems progresses rapidly in the next years. While technological innovation brings numerous promises when it comes to safety and the reduction of road fatalities, it is also necessary to minimize the upcoming risks of these new technologies and to guarantee a practical and workable transition towards the new forms of mobility. The event was closed by Mr. G Muller (CITA Vice President – Technical Affaires) pointing out the huge amount of work to do: at first, assess the impact of new technologies in the way that society understands the road transport; secondly, the definition of new scenarios must be very careful as new road technologies are generating a huge amount of data and the management of data means power.